It’s always nice to see a genuinely original game hit the casinos and unless we’re mistaken we’ve not seen anything like Imperial 7s before. It’s developed by Probability Jones on Odobo’s delivery platform and although the gameplay is simple it’s all very polished and classy. Imperial 7s is played on a plush red table and we are clearly at a top quality casino here; the aim of this game is to reach a total of 7, 14 or 21 points with two playing cards over a total of five rounds. In addition you must accomplish this task before the dealer. Kick things off by placing selecting a chip size and then placing this bet in the ante box above those chips. You can then also place a side bet on the exact outcome (winner plus total) and these odds are listed above the side bet boxes. It’s possible to draw of course in which case you’re stake will be returned. If there is no winner you receive half of your stake back. If you are a winner your stake will be doubled. That’s all there is to it – a basic game designed in a way which makes you want to play again, which you can if you use the ‘Repeat’ button below the reels. If you’re using side bets don’t forget to gear your gameplay towards reaching that particular target. 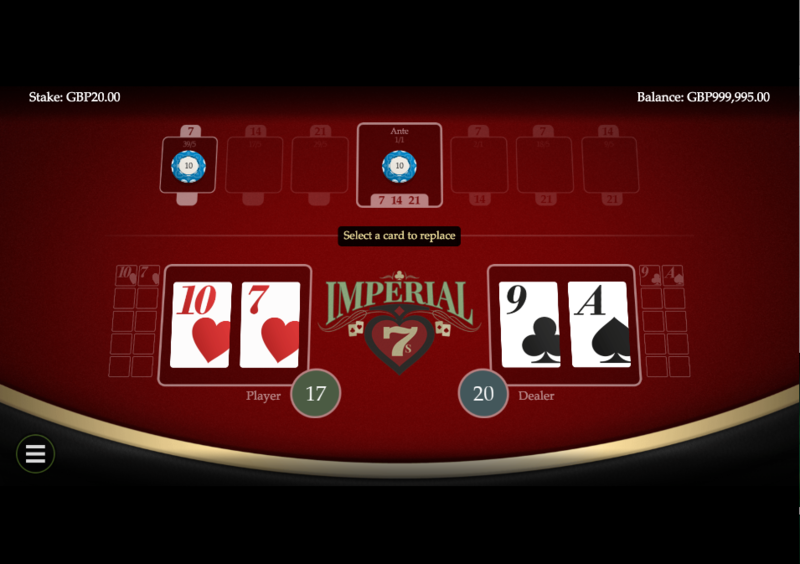 Imperial 7s is an interesting and original game which is enhanced by the addition of the side bets for the more adventurous. It comes complete with an RTP of 96.80%.